I take scouting seriously: my family recited the Boy Scout Law at my father’s funeral as my brother, an Eagle Scout, wept. 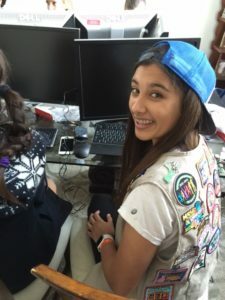 Last week, I started a blog about how programs like scouting and the Broadcom MASTERS® create modern-day rites of passage through which young people can find their place in a society that amplifies the positive values and aspirational interests that enables them to become adults in-full and leaders in science, engineering, letters and the arts as well as society at large. Marking the dawn for yet another superhero revival, Wonder Woman, is enjoying a much-anticipated reprise at movie theaters everywhere — the popular comic heroine finally displays her superpower strength on the big screen. An idol to young women everywhere, Wonder Woman demonstrates power and ability in both body and mind — she is able to solve problems using what we now call ‘21st century skills’ — problem solving, communication, collaboration and creativity. How can your own little (K-12) wonder woman acquire these skills? By learning to code! Check out this fun game by Google Play, Made with Code and Warner Bros. Help Wonder Woman fight the bad guys and learn programming concepts at the same time. 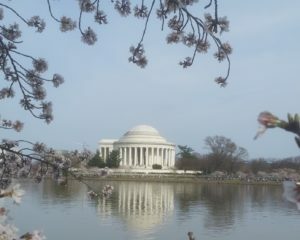 This spring, my friend sent me a photo of the Jefferson Memorial, which we visited long before the ascension of Donald Trump and his Republican Congress. The image triggered this thought: were he here today, Thomas Jefferson – scientist, engineer, inventor, botanist, author of the Declaration of Independence, third president of the United States and founder of the University of Virginia (the first to open a school of engineering and applied sciences,) would be leading the March for Science on April 22. Throngs of scientists and science-minded citizens like me are marching in resistance to the president’s draconian appointments and policies that disavow established science, quell critical thinking, abrogate fact-based knowledge and threaten to roll back advancements in scientific research and education. Thomas Jefferson would not be pleased; and his immortal words, engraved on the porticos of his memorial, sum up the reasons why my STEM colleagues, the Union of Concerned Scientists and I will march on Washington DC this spring. Today – March 14th – marks International Pi Day – Pi (Greek letter “π”) is the symbol used in mathematics to represent a constant — the ratio of the circumference of a circle to its diameter — which is approximately 3.14159…. and so on. Pi has been calculated to over one trillion digits beyond its decimal point! International Pi Day is a great time celebrate math and celebrate those who strive to introduce computer coding to all. 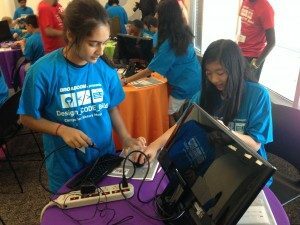 Not just because we think coding is fun (and it is once you get the hang of it,) but because there are over 2.4 million STEM jobs waiting to be filled by young and old alike. “If more st udents and workers aren’t inspired to stick with STEM and coding, we will not have the millions of new workers needed [to make] our connected world a reality,” according to Time Magazine’s Tim Bajarin in his article How STEM Skills Are the Next Great Equalizer. Opportunity is knocking for the next champion of the world’s longest-running, largest, most prestigious and most inclusive high school STEM competition to step forward: the International Science and Engineering Fair (ISEF) is up for grabs. Deftly guided by the Society for Science and the Public for seventy years, science fair systems sponsored respectively by industry giants of their era – Westinghouse (from 1942 to 1997) and Intel (from 1998- the present) – are at the epicenter of virtually every state, national and international STEM education movement. 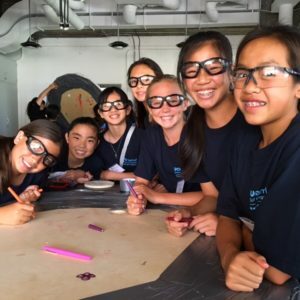 Their renowned competitions, Science Talent Search, International Science and Engineering Fair and Broadcom MASTERS help drive our urgent imperative to educate disciplined, audacious STEM-literate adults at all levels of society who will fill millions upon millions of 21st century jobs that require flexible competencies in math, science and engineering. The “132005 Scottmcgregor” is not a large asteroid (it clocks in at about 2 to5 km in diameter), but it is big enough to cause similar damage as the one that is theorized to have killed off the dinosaurs about 65.5 million years ago. Discovered by MIT Lincoln Laboratory’s Near-Earth Asteroid Research program (LINEAR), former Broadcom Chief Executive Officer and President, Scott McGregor, landed naming rights to the 132005 asteroid, a rocky space body that orbits the sun. McGregor was honored with a celestial namesake by the Broadcom Foundation, Society for Science and the Public (SSP) and the CERES Connection to recognize his role in creating the Broadcom MASTERS science and engineering competition for middle school students, a program that marked its sixth anniversary last October. The auspicious number of the asteroid assigned to McGregor coincides with the day he became President and CEO of Broadcom –132005 – January 3, 2005. A sardonic critique from a politician on the other side of Trump’s ‘great wall’ designed to keep jobs in and émigrés out? Not so. The Broadcom MASTERS®, the premier national middle school competition organized by Society for Science & the Public, is a direct descendent of the Wes tinghouse Science Talent Search, which was founded toward the end of World War II when Isaacson’s story begins. The Westinghouse Science Talent Search was created in 1942 to nurture and elevate a generation of science and engineering innovators. Baby Boomers like me remember running in from backyard play on Friday evening to catch the official announcement of the science talent search winner on our black and white television.